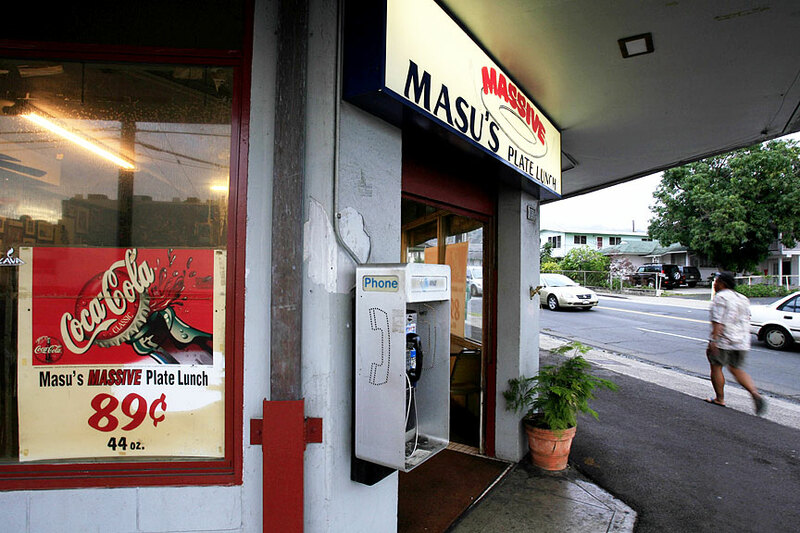 The well-known Masu's Massive Plate Lunch in Liliha will close next month to make way for a new branch of Finance Factors, which recently bought the restaurant's building. Masu's owner Paul Masuoka, 62, says that after many years of business, he plans to retire. The restaurant had been at the 1808 Liliha St. location for 15 years, and its lease expires this month. Masuoka said that when he learned the building would be sold, he initially thought of relocating but then decided it was time to move on to something else. After the restaurant closes, Finance Factors plans to renovate the space for the new branch. "We are thankful to our many loyal customers and have enjoyed the many years of business at this location," Masuoka said. "I am really tired, for over 30 years, getting up at 3 a.m. We've had wonderful years. We had some downs but it was mostly up. It's perfect timing." Masuoka said the agreement to close was mutual between him and Finance Factors, which bought the building from Honda Properties Ltd. for an undisclosed price. Added Steven Teruya, president and COO of Finance Factors, "We wish the Masuoka family the best as they pursue other professional and personal opportunities. We look forward to maintaining the charm and appeal of this historic area in Liliha as it undergoes the current transformation." Though Masu's lease ends this month, Masuoka says he will have until Feb. 28 to clean up everything and hand over the keys. The 11,654-square-foot building at the corner of Kuakini and Liliha streets is home to a handful of tenants that include a barber shop, 11 residential apartments and Masu's. The sale of the building, brokered by Karen Taniyama of Sofos Realty, closed on Dec. 22. Masuoka said that after his mother, Yoshiko Masuoka, died in 2004, he felt like he had lost two employees. "It was my mother and I running the restaurant," he said. "She was like two employees in one ... and the work was just getting too much." His mother had co-founded the restaurant, which moved twice before settling at its current location around 1990. The business was known for giving generous portions in its plate lunches for a bargain price, with specials that changed daily. Plates ranged from beef curry to pork cutlet, Masu's hamburger steak, laulau, mahimahi and teriyaki chicken, all for well under $10. Finance Factors, meanwhile, plans to refurbish the apartments with new paint and repairs. "The addition of this property to our holdings is significant as we expand our branch network," Teruya said. Finance Enterprises, the parent company of Finance Factors, also owns land beneath Liliha Square Shopping Center, home to Times Super Market, along with Liliha Shopping Center and various buildings in downtown Honolulu. The new ownership of the Masu's building can be seen as a sign of revitalization of the Liliha neighborhood, as well as change, some of which has drawn concerns from residents over the preservation of the area's character. In mid-November, Longs Drug Stores tore down a building at 1748 Liliha St. known in the neighborhood as the "Midori Dressmaking Building." Longs bought the building in March, according to city records, with plans to build a pharmacy at the location. It was granted a demolition permit from the city in mid-November. Rep. Corinne Ching (R, Nuuanu-Liliha) opposed the demolition of the Midori building and expressed concerns about the gentrification of the neighborhood. "We were hoping that Longs could just retrofit the building because it was in good condition," Ching said. "It's my kuleana to express the wishes of the residents that they would like to see the character of Liliha preserved." Ching said she hopes the architecture of Liliha, which reflects a pre-statehood period, could be kept to reflect its heritage. Unlike nearby Chinatown, however, Liliha is zoned as a primary urban center and is not under any special district requirements. The height limit for the Longs site in Liliha, zoned B-2 community business, is 125 feet. Finance Factors, founded in 1952 by six island families, has grown to become a large company offering residential and commercial real estate loans as well as certificates of deposit and savings accounts. Finance Factors has 11 branches in the state as well as a mortgage center in Guam.